Many Alaskan hunting guides consider Dall Sheep to be the state's premier hunt. AAO offers guided hunts in which we use bush planes to access remote, mountainous areas where we hunt mostly on foot. We offer backpack hunts where we may spike-out in sheep country between stays at base camps. We operate out of several well outfitted camps and cabins in the Alaska Range and Talkeetna Mountains which allows for ideal access to prime areas. Dall Sheep hunters should be up for challenge and adventure. The price of a fully outfitted, guided sheep hunt is $17,000. All hunts are one guide per client (1x1). There are no hidden costs. Sheep Hunting Pictures now available! Sheep hunting can be very strenuous; physical conditioning prior to a hunt is important. The most important thing you can do to increase your enjoyment and improve your chances of success is to be as physically fit as possible. When considering a workout or exercise routine to prepare you for the hunt, focus on improving cardiovascular and endurance while strengthening leg muscles. Climbing hills or stairs works well. Start without any weight and slowly work up to 30 or 40 pounds in your pack. Get your heart rate up and keep it up for an hour or two. We can accommodate hunters with physical challenges, just do your best. Most sheep guides will agree that mental preparedness is equally or even more important than your physical shape. Patience and determination will get you to your ram regardless the pace. 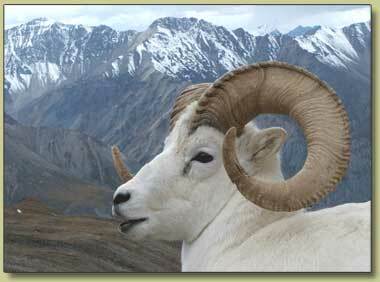 Dall sheep are very alert and use their keen eyesight to detect potential predators at great distances. Often times when stalking rams it is advantageous to climb above them, for they seem to be more focused on watching for danger from below. Though not particularly sensitive to the sound of footfalls on stones or sliding rocks, they will quickly key in on an out of place noise such as the clank of a trekking pole or the sound of a rifle's action. Sheep can easily disappear into the rocky cuts and folds of the mountain terrain they inhabit. Quality optics and frequent glassing will aid in detecting rams before they detect you. 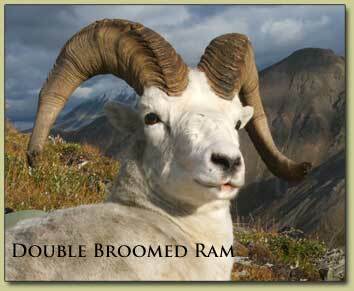 If a mature ram detects a hunter, he may move into inaccessible terrain or flee the area. Mountain sheep tend to stay close to steep rugged terrain in which they use to escape predators (and hunters). Rams socialize in small groups mostly isolated from groups of ewes and lambs, except during the mating season which occurs around November. Rams establish a strictly adhered to social order by butting heads and displays of horn mass. Though rams may live to 13 years of age, the mortality rate increases drastically after 8 years; also the age at which rams become fully involved in the rut. There is a dizzying amount of Sheep hunting gear to choose from when preparing for a trip to Alaska. Recommendations will vary between guides and outfitters. Keep in mind, you don't need to be decked out in the latest and greatest gear or equipment to have a great sheep hunt. Check out the Sheep Hunting Gear List for detailed information on what to bring. 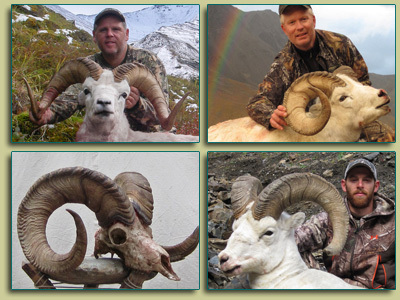 How Much Does it cost for a Dall Sheep hunt? The 2019 price of a fully outfitted, 10 day guided Dall Sheep hunt is $17,000. Sheep hunting season is from August 10th to September 20th. request a client reference list, Please contact us. What makes a Legal Ram? 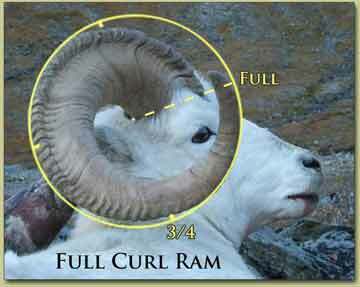 A full curl ram, whose tip of at least one horn has grown through 360 degrees of a circle described by the outer surface of the horn, as viewed from the side. A ram at least 8 years old as determined by counting annual horn rings and segments. 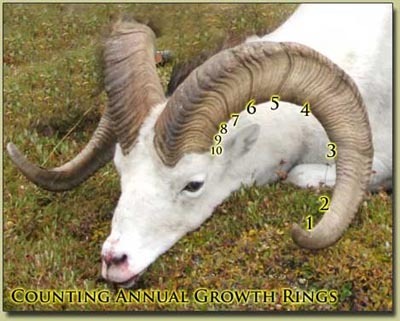 Because of false rings and narrow horn segments on older rams, it can be difficult and risky to age a ram in the field by counting horn rings.